In May 2011, I visited one of my favorite places within Chaco Culture Historical Park, which is Kin Klizhin Ruin. On my way from camp to Kin Klizhin, I had already seen an elk herd on the mesa and visited Windmill Hill, where ranchers had installed a new windmill over a dry hole. Now it was late afternoon and time to head for the ruin in time for sunset. From previous visits, I knew that the current road to Kin Klizhin paralleled an ancient pathway, which entered Chaco Canyon from the south. Rather than following the varied terrain, Anasazi visitors to the area tended to travel in alignment with the cardinal points of the compass. Looking east from the road, I could see occasional small mounds that may have been marked the trail for ancient travelers. After stopping to inspect one mound, I walked carefully back to my truck. Once disturbed, the fragile soils of the area are subject to rapid erosion. By following a sandy watercourse, I avoided stepping on the cryptobiotic soils that make up much of the local terrain. Closer to the road, I found an area scoured by wind and water. Lying among the pebbles on the sandy surface was a number of potsherds. The largest of the fragments was almost pure white; its concave shape indicating that it was a small part of a much larger pottery vessel. When I reached down and turned it over, I could see that it was an elegant piece of black on white pottery. Found as far north as Wilcox Ranch, Utah and as far south as Antelope Mesa, Arizona, the high-contrast decoration of black on white pottery can turn utilitarian objects into great art. On my fragment, three rippled waves of water lay beneath a white cloud, which was rolling across a dark sky. The symbolism left little doubt that the original vessel served to carry water across the dry terrain. According to Author Craig Childs, “archeologists excavate (black on white) painted jars as large as watermelons” from one Chaco Canyon site. Because of its remote location, I assume that someone dropped the water carrier along the trail. However, because of their ubiquity in the environment, early ranchers coined the word “potshot” for target practice using ancient vessels. Either way, this was a potsherd to love and cherish, if only in pictures. After cleaning the fragment and taking several pictures, I returned it to its original spot. Although it would have made a fine artifact under glass, its real home was where I found it. By placing it back, face down in the spot where I had found it, I allowed another to come along and find it in the future. By publishing its image and identifying its native surroundings, I add to the general knowledge of black on white ware. The U.S. Antiquities Act of 1906 made it illegal to remove any ancient artifact from public lands. Over the years, many people have ignored the law, taking whatever they found and placing those objects in private collections. As Craig Child’s argues in his book, “Finders Keepers: A Tale of Archaeological Plunder and Obsession”, once any artifact is removed from its surroundings, its historical context is lost forever. The following day, when I described my discovery to the Gallo Campground host, he was pleased that I had respected the artifact and its context. “When we find a particularly nice potsherd, we dig a hole with our heel and bury it there”, he told me. Although his method may secure the future of the artifact for another century or two, mine left it on the land, where it belonged. I hope that when I visit Kin Klizhin once again, my treasure will still be there, reflecting light like a windmill in the sun. If you find this or other artifacts, I hope that you will respect the spirit of the ancients, allowing them to stay at home in the High Southwest. I was the only human visiting Kin Klizhin that afternoon. Although not as large as other Chaco Canyon great houses, the unusual setting and architecture allows Kin Klizhin to stand out from its peers. Unique in Chaco Culture, Kin Klizhin featured three aboveground circular kivas, each set within a rectilinear outer structure. The inner walls of the largest kiva are more than twice as high as the other two. Looking up from inside the larger Tower Kiva, I felt the grandeur of this ancient place. Perhaps that is what early visitors to Chaco Canyon felt upon arrival at this outlier, or welcome center. The main west-facing wall of Kin Klizhin is its largest bulwark. The remainder of the structure, including a former enclosed courtyard was to the east of there. 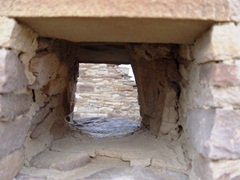 Although it is massive, there are only two small ventilation holes or Ancestral Puebloan windows on the west wall. One is set low, probably used to draw air to a hearth inside. The other is at eyelevel, and is an obvious viewing port. From a relatively small inside hole-in-the-wall, the opening expands as it penetrates toward the exterior. This arrangement allowed someone inside to have a wide field of view, but kept the penetration of the structure as small as possible. As sunset approached, I stayed inside the roofless structure, waiting for the right moment. Any photographer will tell you that catching the right moment requires luck, skill and many shots. Of the dozen portal shots I took that day, the pair pictured here are my favorites. The small image is from the outside, looking into the structure. If you click on that image, you will see the larger picture, looking out towards the sunset at Kin Klizhin, Chaco Canyon, New Mexico.